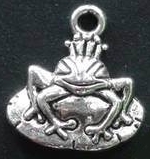 This is a Silver Frog Prince Charm. He is on his lilypad with a cute little crown on his head. The charm is 5/8 in. long and 5/8 in. across and is highly detailed on one side. You will receive one charm with each quantity that you order. **NEW Tim Holtz Idea-ology Clip Carousel Great ATC Holder!